The Reverend John Sinclair Free Church Minister Bruan died 22nd August 1843 aged 42. He was a burning and shining light of eminent gifts and graces. Deep experience and holy life, powerful, zealous and spiritual as a preacher and minister of the word. Faithful, affectionate and beloved as a relative, friend and pastor. The people of his charge while erecting this tribute to his memory desire to give all the glory to him to whom it pertains. 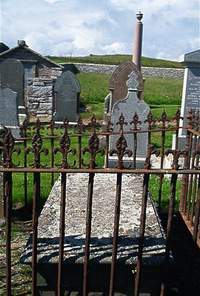 Wife Dorothea Wilson died in Edinburgh 25th May 1855 interred here daughter of William Wilson banker of Thurso.